MRG, in partnership with SOS-Esclaves and Anti-Slavery International is working toward eradicating slavery and supporting the full integration of people emerging from slavery in civil society. This programme aims to provide support, skills and opportunities for 310 people who are emerging from slavery and help them achieve socio-economic independence and rights, including their citizenship. The purpose of this project is also to strengthen the legal framework in order to make it easier to identify and prosecute slavery crimes. Lastly, the project works toward developing the ability of the media to promote messages of anti-slavery and anti-discrimination. Mauritania has the one of most entrenched systems of slavery in the world. 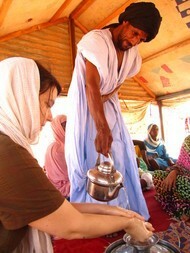 Today, members of Mauritania’s Haratine community continue to be oppressed by an historic system of slavery. The Haratine (Black Moors) are a slave-descended population who were historically raided and enslaved by the Beidan (White Moors) who are dominant in the country’s government, military, businesses and resources. They suffer discrimination, marginalisation and exclusion at the hands of Mauritania’s dominant ethnic group, the Beidan, because they belong to the ‘slave’ class. Mauritania is also home to other Black ethnic groups in the country who were never enslaved by the Beidan, such as the Pulaar, Wolof and Soninke; these groups are known collectively as Black Mauritanians and have a tradition of slavery and feudal hierarchy. However, while some discriminatory practices remain, slavery in its purest form is rarely practised. Black Mauritanians also face discrimination and exclusion by the White Moor elites, and (like people of slave descent) have great difficulties gaining access to national identity and citizenship rights. Haratine slaves live under the direct control of their masters and mistresses; they are treated as property and receive no payment for their work. Slave status is passed down from mother to child, so children born to a mother in slavery will be ‘inherited’ by the children of the master. It is extremely difficult for people leaving slavery to obtain national identity. The Mauritanian authorities often claim that slavery no longer exists, because it was abolished and criminalised by the 2007 Anti-Slavery Law, which prohibits slavery and related discrimination. However, there is clear evidence that this law is not respected or implemented in practice. It has become clear that the new Mauritanian 2015 anti-slavery law, which repealed the 2007 law, remains to be applied effectively. Mauritanian antislavery organisations estimate that thousands of Haratine are still enslaved or living under some form of control by their former masters. MRG has also worked on a programme addressing gender equality: Mauritania: Gender equality for Haratines and released the documentary Documentaire – Mauritanie: Esclaves et discriminee: l’émancipation des femmes Haratines which can be watched here.